Point Cook Centrals won just four games last season, this year, it’s been a different story. The Sharks ended the regular season in top spot, having won 15 of a possible 18 games. However, that’s not where the story ends, the team from Featherbrook Reserve won the Second Semi Final and will take on the Wyndham Suns in the Division 3 Grand Final on Saturday. The game gives the Senior team a chance to create some history for the club. Coach Darren Findlay says standing up in-front of their faithful with the Premiership Cup would be a great achievement. “It would mean a lot to our club and supporters considering where we have come from last year and the decisions that were made to enhance our club and its identity,” he said. Findlay said the Sharks’ season has been extremely positive, considering how young the group is. “We have continued to develop our juniors in both the boys and girls grades, we launched our inaugural season of our Senior Women’s team who had an amazing first year together and as a direct result, has seen our club continue to grow,” he said. Finally, Findlay encouraged of the clubs supporters to get to the Grand Final and support the team. “As a playing group, we would like to thank our committee, supporters, sponsors/partners and all those involved in our club,” he said. The Wyndham Suns’ goal at the start of the season was to play-off in the Division 3 Grand Final. The Suns started the season on fire, winning their first 12 games. They hit a road block in the middle of the season, but have since regained some form and now find themselves preparing for Saturday’s Grand Final. 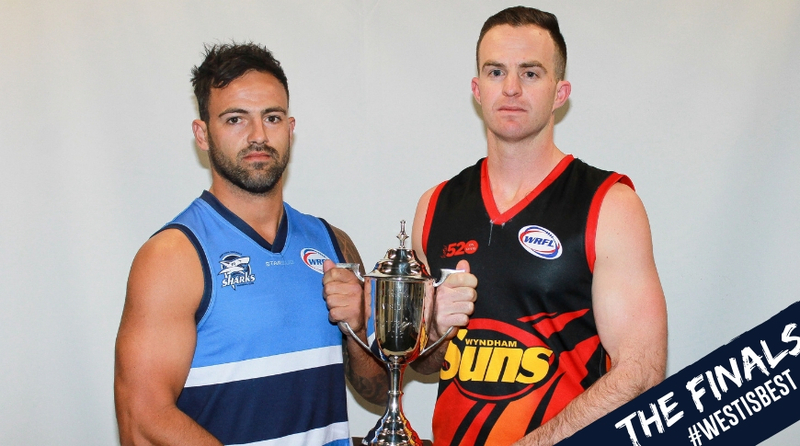 The Suns defeated Braybrook and Tarneit over the past two weeks and will take on Point Cook Centrals in the decider. “There are always challenges during the season and there has certainly been some tough ones, but the focus has been on what’s positive for the club,” coach Michael Boothey said. “We’ve had 10 young men under the age of 19 play Senior football in a season where we finished 14-4 and playing in a Grand Final, which was the goal at the start of the season. “This will be the clubs first Senior Grand Final appearance so there is a real buzz around the place. Boothey said it would be a great honour to coach the club to their first Senior premiership. “Personally, all I’ve wanted is for the playing group and the people around the club who work tirelessly to experience the enjoyment of winning a Senior Premiership and to be promoted to Division 2,” he said. Finally, Boothey wanted thank everyone involved at the Wyndham Suns for their ongoing support. “I’d like to thank everyone involved with the Suns who put their own personal time aside to give our players the opportunity to be involved with community football at a great club, not only on field, but off the field as well,” he said. Point Cook Centrals coach Sam Lachimia says he is proud of his team’s achievements this year and winning the premiership on Saturday would be a great reward for his players. The Sharks finished in second spot on the ladder after the home and away season and upset ladder leaders Tarneit in the Second Semi Final to earn the week off and a spot in the Division 3 Reserves Grand Final. “I’m very proud of the boys and the club in general, our aim was to play finals this season, but to reach a Grand Final has been really rewarding,” Lachimia said. Lachimia said he wanted to thank his support staff that has helped him all season, Derek Gatt, Jordan Johnson Bow and Katie Hateley. Tarneit’s Reserves coach Cameron Evans is urging his team to make the most of their opportunities in their Grand Final on Saturday, saying chances to play in such a game don’t come around that often. Evans said there was a lot of excitement at the club ahead of the big match with Point Cook Centrals, a team they have several great battles with in 2018. “A premiership is the reward for all the hard work and commitment for the players, coaches, committee, volunteers and supporters,” he said. Tarneit finished the regular season in first place, but lost to the Sharks in the Second Semi Final. The Titans defeated the Suns in the Preliminary Final at the weekend, booking their place in the final game of the year. “It has been a challenging year with a lot of highs and some lows. We have had our challenges this year through injuries but this is no different to every other team,” Evans said. Evans wanted to thank his assistant coaches Arthur, Travis and Trent for their support this year. “I want to thank our committees and volunteers for the support,” he said. “The players for backing me in and to always wanting to improve, this is the best group of players I have been involved with.